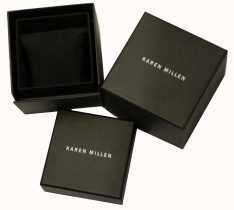 Authorised retailer for Karen Millen Watches. Free delivery, 30 day free returns and five-star rated service. Buy now with up to 12 months 0% finance. Karen Millen is a ladies fashion brand which is known all over the world for creating beautiful fashion. Karen Millen are a truly international brand and they have stores in 65 countries all over the world. The range of Karen Millen watches is so wide that you'll certainly be able to find a fashionable watch to match any outfit. Karen Millen founded the company in 1981 in a partnership with Kevin Stanford. They took a loan of £100 out to buy a thousand meters of white cotton and manufactured white shirts which they sold to their friends. Following a successful party plan network, the first Karen Millen store was opened in 1983 in Maidstone, Kent. Throughout the 1990's the company continued to grow and expanded worldwide. Karen Millen's move into the watch market has been incredibly successful with the range set to be exported to more countries during 2015. Karen Millen is all about high street dressing for confident women and the watch range is here to compliment the clothing range which is immensely popular. With super stylish watches like the Karen Millen KM137W White Leather Ladies Watch and the Karen Millen KM107GM Gold Plated Quartz Watch, Karen Millen have created a range of watches which show off this confident style perfectly. There is truly something to suit any style in this fantastic range of watches. From thin bracelet watches to water resistant stainless steel watches to uniquely designed watches with a leather strap . The range is so diverse that the only things that appears to link the watches together are the accurate quartz movement inside each watch... and how incredibly stylish they are!